A magnitude 2.6 earthquake was recorded south of San Antonio Friday evening. AUSTIN, Texas — A magnitude 2.6 earthquake was recorded Friday night in South Texas. 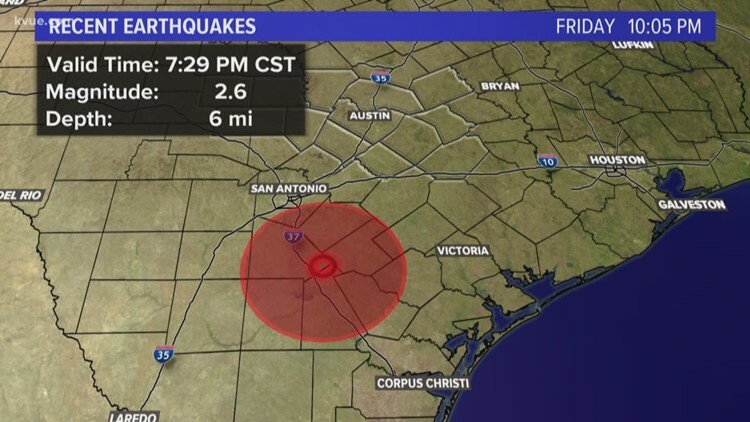 The earthquake was centered in northern Live Oak County near the community of Three Rivers, about 55 miles south-southeast of San Antonio. This was a weak earthquake for this part of the United States, and no damage or injuries have been reported. On October 20, 2011, a magnitude 4.8 earthquake hit in generally the same area and was the strongest in recorded history for that part of Texas. In 2011, the United States Geological Survey (USGS) reported that people from as far south as Corpus Christi and Kingsville and as far north as San Marcos, Austin, Burnet, Round Rock and Georgetown felt a weak to light shake. In 1993, a magnitude 4.3 earthquake shook the same area. Experts say these two quakes are most likely due to the exploration and extraction of natural gas. Although the act of drilling does not induce earthquakes, the extraction or pumping of fluids at oil and gas fields can. With a history of earthquakes in South Texas, can earthquakes happen in the Austin area? The answer is yes, although very rare. A book entitled Texas Earthquakes by Cliff Frohlich and Scott D. Davis provides excellent information of two earthquakes in the Austin area. One occurred in January 1887 and the other in October 1902. On October 9, 1902, an estimated magnitude 3.9 earthquake shook Austin. The epicenter was in southern Travis County, near the community of Creedmoor. Frohlich and Davis provide a piece of a report published in the 'Austin Daily Statesman' of some people thinking Round Mountain or Pilot Knob where in a state of eruption as they were on the lookout for molten lava. Also in the book is a piece from the 'San Antonio Express,' where a farmer in Cedar Creek concluded the shaking was caused by a meteor hitting Pilot Knob. Another earthquake was reported on January 5, 1887. The estimated magnitude 4.1 quake was centered in eastern Bastrop County near the community of Paige. People in Austin, Bastrop, Elgin and Giddings all reported the shake. No major damage was reported. Frohlich and Davis mention that neither quake can be blamed on petroleum production or exploration since oil was not discovered in this part of the state until 1912. Instead, a series of faults are likely the culprit. The Ouachita Belt stretches from Arkansas and Oklahoma, southward into Texas and Mexico. The series of faults that make up the Ouachita are: the Mexia-Talco, the Balcones, the Charlotte-Jourdanton and the Luling, according to Frohlich and Davis. The 1902 earthquake in Southern Travis County was likely associated with the Balcones Fault, while the 1887 quake in Bastrop County was most likely linked to the Mexia-Talco system, according to Frohlich and Davis. None of the local faults are very active right now. About 10 million years ago, the Balcones Fault was very active, but will likely remain inactive. So, other than a little shake now and then, South-Central Texans can rest easy from the threat of damaging earthquakes. If you would like more information about the history of earthquakes in the Lone Star State, pick up Texas Earthquakes by Cliff Frohlich and Scott D Davis, ISBN: 0-292-72551-5.